Italian, Thai, Moroccan and British Dishes delivered at your door in just 30 minutes. Fill in the order form or give us a ring and we are at your service. We deliver to any part of London. Macaroni in a creamy sauce of mature farmhouse Cheddar cheese. A taste of rural France. Pieces of silverside beef are slow-cooked for three hours in red wine and port before adding dry-cured bacon and mushrooms. Green Thai Chicken Curry with bamboo shoots, peppers and a garnish of red birdseye chilli and lime leaf. 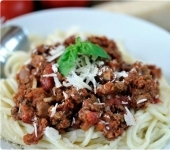 Minced beef in tomato and red wine bolognaise sauce with spaghetti. Chunks of tender lamb braised in a rich lamb stock with root vegetables and served with minted new potatoes. A meal in itself that’s very low in calories and fat. With rice noodles, green soya beans and nori seaweed (as used to wrap sushi rolls), this is definitely one for fans of Japanese food. Arborio rice with garden pois, flageolet beans, fresh mint and a knob of lemon and mint butter.